The 1969 Album of the Week is Led Zeppelin’s self-titled debut album which was released 50 years ago today. 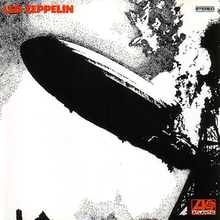 It had been recorded in September and October of 1968 at Olympic Studios in London. 1969 was a busy year for the newly formed group- they were touring North America when the album was released and they would also find time to record their second album which would be released in late October 1969. Led Zeppelin- were led by guitarist Jimmy Page who produced the album, singer- Robert Plant, bassist and keyboardist John Paul Jones and drummer John Bonham. Page was the most well known of the four when the group got together- already a Guitar God from his time with The Yardbirds. The group hadn’t been together all that long when they went into the studio and recorded this album. Their original name was The New Yardbirds before they changed it to Led Zeppelin. Page who started the group had asked Terry Reid to be the lead singer- he declined but suggested Robert Plant who was the singer for a group called Band Of Joy. Like The Beatles where John brought in Paul and Paul brought in George- Robert Plant suggested former Band Of Joy drummer John Bonham to be the bands drummer. As soon as they heard Bonham play they knew they were on to something big. The original bassist was to be Chris Dreja but he dropped out be become a photographer. A session player named John Paul Jones who Page had known from their days playing sessions inquired about the job and the band was together. The first album took nine days to record and was based on the live set they were playing in Europe at the time. Jimmy Page covered to cost of the recording sessions. They spent about 36 hours total in the studio recording the album and most of it was recorded live with few overdubs. The group was signed with Atlantic Records. The debut album has nine songs that clock in at 44:56. Led Zeppelin would be an album band- they would only have six Top 40 hits in the United States. On the debut the first song- Good Times Bad Times was the only singles release and it peaked in the US at #66. The b-side was Communication Breakdown. Both songs were under 3 minutes- perfect for a single. Good Times Bad Times has the distinction of being the first Led Zeppelin song on the first Led Zeppelin album. Led Zeppelin would rarely perform Good Times Bad Times in concert. Led Zeppelin had problems early on nicking others songs and claiming them to be their own- Babe I’m Gonna Leave You is an example. They listed it as traditional but it was written by Ann Bredon in 1959. Joan Baez covered in the early 60’s and didn’t know who wrote it so she put traditional- and Page didn’t have the corrected version of the Baez song so he listed it as traditional also- arranged by Page. Bredon would later get credit. Dazed and Confused probably the best song on the album- was influenced by a song that Page heard Jake Holmes perform. Page changed it around a bit and thought he’d escape a plagiarism suit- and did for years. Holmes finally filed suit in 2010 and got a settlement from Page. The song credit now reads Page -inspired by Jake Holmes. My Mount Rushmore of songs from this album would be- Dazed And Confused/ Communication Breakdown/ Good Times Bad Times and How Many More Years. The album is a fusion of blues and rock. There are those who also call Communication Breakdown the first heavy metal song. Its funny how opinions can change over time. When the album came out critics were very mixed about the album. 50 years later it is almost universally praised. A few examples Rolling Stone magazine listed it as the 29th greatest album ever in 2012. Q listed it as #6 in a 21 albums that changed music list. As far as debut albums- Uncut ranked it #7 greatest debut ever. The album reached #7 on the US album charts and has sold 7 million copies over the years. In the UK it went one higher peaking at #6. My husband was a huge Zeppelin fan, back in the day. I wasn’t, though I have always appreciated them. When I was a teenager just about all the stoners were into Led Zeppelin and as a young adult they congested the classic rock stations. Now days, the youngsters hardly give them a thought. The Beatles and Motorhead are more popular with the youngsters. Led Zeppelin is a monster of a debut album. One of the best debut albums in music history, in my opinion. I wonder if they would have been as successful if they had stuck with The New Yardbirds? Led Zeppelin is who they are! One of those things that was meant to be (their name). You are right Led Zeppelin- a perfect name for them. I remember reading about an early critic predicting they would crash and burn like a led zeppelin…wasn’t there some interesting story/connection there? I remember hearing the story they got there name- there was talk of Page and Jeff Beck being in a band together and Keith Moon said it would go over like a Led Zeppelin… something on that order. Great post! You beat me to it. Hope you enjoy mine! Thanks. I am sure I will. Somewhere on my hard drive I have a Yardbirds version with Keith Relf singing Dazed and Confused, Good then too. Jimmy Page realised quickly that Communication Breakdown was a bad idea as the riff involved multiple downstrokes (? – possibly up – dunno I never mastered a guitar) and was quite strenuous to play. Just imagine buying that LP back then and putting on side 1, track 1. Good times bad times…that must have blown the tops of some heads!!!! I can’t imagine what it was like- so many of my favorite bands are like that- I got to know them after the fact. What would it have been like-as you say putting the needle down on Good Times Bad Times… or discovering The Beatles and The Rolling Stones etc- as they broke. This is in my top twenty of albums, and I note it was mostly blues influenced.